Xeriscaping is a term that was coined by the Colorado Waterwise Council. It is a combination of seven common-sense gardening principles that save water while creating a lush and colorful landscape. Like a house, a well-designed landscape should start with a plan, or rather, a series of plans. The first plan is a base plan which shows the major elements of the current landscape, including the footprint of the house, driveway, patios, walkways and all existing trees, shrubs and garden beds. The base plan should also show directions (indicate which way is north), and should include the location of spigots, downspouts and external electrical outlets. Contrary to what you may have heard, converting your yard to Xeriscape does NOT mean you have to get rid of all the grass. It does mean you need to think about where it makes sense to have grass, rather than just putting turf everywhere. While traditional landscaping in America has always included expanses of lawn, in Colorado's semi-arid climate many grasses need a lot of supplemental irrigation to stay green and lush. That's why it's important to limit grass to areas in the yard that need to be useful lawn. There is a misconception among some people that the only plants allowed in a Xeriscape are cactus and other desert perennials. Nothing could be farther from the truth! 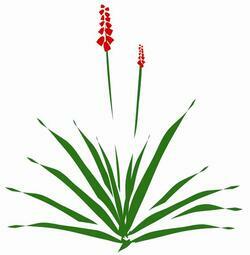 There are a large number of plants that do well in our semi-arid climate with little or no supplemental irrigation. The trick to waterwise gardening is to put the right plants in the right place. to establish the deep root systems necessary to survive a drought. Mulch is an essential component of gardening in a semi-arid climate like ours, for several reasons. Mulching minimizes evaporation. It cools plant root zones, which reduces the amount of water plants lose through evapotranspiration. It reduces weed growth, and it helps control erosion. Mulch also adds a finished look to the garden. Once you’ve installed a Xeriscape, it’s important to water it efficiently. Efficient irrigation is the planned management of water in the landscape to prevent waste and over use. In order to achieve this goal you must understand both the plant water requirements and the operating specifications of the irrigation equipment. BASIC PRINCIPLES Although irrigation systems can range from a new automatic system to a sprinkler attached to the end of a hose, there are some basic principles that will allow you to be more efficient with your water use. fertilizing lawns, and controlling pests.